We are trained and certified leather cleaners, taught by Europe's leading leather care specialists - Leather Training & Technical. Their late technical director Andrew Allcock was one of the world's top leather care specialists and was the most highly qualified leather technician outside of America. We use his methods of cleaning and his company's market leading cleaning solutions to give your leather the right clean and the best possible finish. We carry out a full diagnostic check of your leather before we start cleaning just to make sure we know exactly what type of leather you have. This is because we know that one leather cleaning solution does not clean all leather types and that is the reason why we have a wide range of Leather Training & Technical's cleaning solutions available to clean and protect your fine leather upholstery. HKS leather cleaning fact - regular cleaning of your leather suite will substantially increase its life expectancy. Leather is easily damaged by dirt build up and body oils as they wear down the protective coating on the leather. Keeping your leather clean is important to ensure it stays in good condition and routine deep cleaning by a fully trained professional is essential to make sure your leather upholstery stays in the best possible condition. You should aim to have your leather suite professionally deep cleaned every 12 months in order to preserve its good looks and condition. 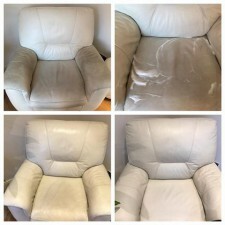 The chair in this picture was deep cleaned by us to the highest possible standard with our fantastic leather cleaning system. All the leather surface is cleaned by hand using our products, cloths and brushes. We advise againt using baby wipes, waxes, oils, general household cleaners, solvents or conditioners on your leather upholstery as this can lead to damage and the weakening of your leather through time with prolonged use. A regular wipe with a damp cloth or L.T.T. Lazy Leather is recommended in between professional cleaning as this helps to correct the moisture level of your leather sofa. Untrained cleaners may claim that they will clean and condition your suite with fine oils and creams. This is wrong and may lead to damage on your suite. Feel free to call us for more information. The sofa in this picture had the grey colour pigment scratched away by the family dog. We were able to achieve a perfect, seamless colour match and you could not find the original traces of damage. You have the complete peace of mind to know that we have all the specialist knowledge and equipment required to do this work and with a significant sum recently invested by us in this, you can be assured that we work to high standards. To keep on top of our craft, we have invested in some leather furniture to continually train and practise in our workshop so that we can get yours 100% right. If you would like to chat to us about your leather cleaning or restoration, please cal us on 08000 463 422.